Early in the year 1980, on March 7th to be exact, a guy named Joe DiMatieo attended a midnight screening of "The Rocky Horror Picture Show" at the Vineland/Cumberland Mall. The guy fell in love with the film, and assembled the cast which would later become known as "The Transducer Players". Although born in Vineland, the cast gained its name and popularity after they moved to the Cherry Hill Mall GCC shortly after their incarnation. They became known as "The Transducer Players of the Cherry Hill Mall" thanks to one Bill Snyder. The cast's venue has changed many times over the years, but has since kept the name "The Transducer Players". In late 1981, the cast had adopted the man that had made the cast what it is today. He started off as Brad, but soon took over as Frank, and injected a sense of fun and humor that the audience craved. The man's name is the one and only Scott Johnston. Scott is the man responsible for attracting many of those who are in this cast today, and shaped the way performances are still held. His retirement in 1991 did not put an end to his legacy. In 1989, The Transducer Players found a permanent home at The Harwan Theatre in Mount Ephraim, NJ. This 60 year old, 650 seat, vaudeville theatre had missed the wrecking ball by inches when purchased by Mr. Sonny Garafalo, who insisted on keeping it a theatre. 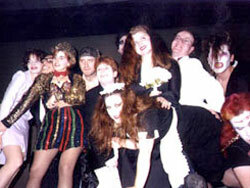 He welcomed Rocky Horror with open arms, and the cast has been there ever since. The management has been diligent in restoring and improving the building, adding a new stage and balconies. This unique theater in combination with The Transducer Players make every performance of Rocky Horror a night to remember. The Transducer Players are today a cast with just 14 active members whose ages range from 20 to 27, currant average Transducer membership being 5 years. Cast alumni is nearly 100 people, but given the fact that the cast is over 15 years old, the turnover rate of cast members is very low. The Transducer Players are very well known for putting on a fun show. The cast attempts to make every show as professional looking as possible with full stage lighting and pyrotechnics, but at the same time dispenses with all things that may tend to make the show stuffy. There is no hierarchy in the cast, and there is no central cast government. Everyone in the cast works towards the same goal which is to make Rocky a great place for all, from Joe Martin who is the Fan Club Representative to Martin Stutzman who is the technical coordinator. No one person is more important than another. The Transducer Players feel that the same goes for different casts, which is that no one cast is better than another. Casts may be different, but being "better" or "more important" than any other is not the way The Transducer Players feel things should be. It's not for personal gain. They love Rocky Horror, and they hope Rocky Horror loves them. "Rocky is here for everyone, and everyone should be here for Rocky."